Hello, Dubai! : Dubai World Cup 2011 Best Dressed Couple! 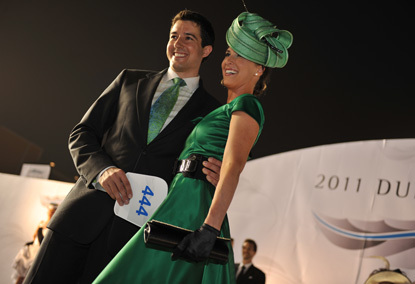 Dubai World Cup 2011 Best Dressed Couple! They say that the third time is the charm and it looks like they were right! After putting our best foot forward in the World Cup's Style Stakes for the past two years, yesterday Matt and I were named the Best Dressed Couple at the Races! The Dubai World Cup has become renown for being the "richest horse race on earth" with the winner taking home a $10 million purse. The Yoshimi Ichikawa-owned Victoire Pisa, trained in Japan by Katsuhiko Sumii, won the Dubai World Cup at the Meydan racetrack on Saturday night, with Italian Mirco Demuro in the saddle. Competition, as always, was as fierce off the field as it was on the field. I really wanted to go with a classic retro look for 2011, so this year I had a dress tailored for the event by Montexa tailoring in Satwa. I gave them a picture of Jackie O, dressed in a peach dress of similar style, and asked if they could turn back time and make me a classic cut retro dress (crinoline and all) in an emerald green color that I had fallen in love with! Karen Hamilton, used her fabulous millinery skills to create a beautiful hat to compliment the dress and accessories. It was wearable art! Karen Hamilton the milliner with the mostest! Knot Standard didn't let Matt down and he leveraged his own line to create the tailored charcoal suit, shirt, tie and pocket square to match. He looked great and managed to match me perfectly - even throwing in some bright green socks for quirky good measure. We headed off to the races with our hopes high - we presumed we should at least be channeling the luck of the Irish with all this green on! Did I mention one of the prizes is we get to drive a Jag for the weekend? After two hours of standing, smiling, twirling and parading in the Style Stakes arena I think I know what it must be like to be a show horse! We were delighted when we made it through to the final round of couples. As the five couples stood on stage, we each had to walk to center stage to be judged. We hoped that the third time would be the charm! As we stood for our turn, cheers and applause spontaneously came up from the crowd, causing the commentator to say "I think we have a crowd favorite here." Matt and I were grinning from ear-to-ear, so excited that our effort was appreciated - but the judges, not the crowd, decide. Miss Fifi just looking very pretty in pink. We waited anxiously for the judging to conclude and when the the announcer said the winners were a couple from the US, I held my breath...and she announced that it was us! We were thrilled! The moment we found out we won! For the next hour we were whisked between photographers and TV crews for interviews. When they asked was I was thinking I responded that, "My Mom is not going to believe this."! A few fellow Americans seek us out to congratulate! The races concluded with some celebratory bubbly and an amazing fireworks display, a wonderful ending to a wonderful day! Nothing tops the day like a great fireworks display! The last click is gorgeous:-)!!! You're living the dream, my man. This blog has changed my life! 29 Is Still a Good Time!